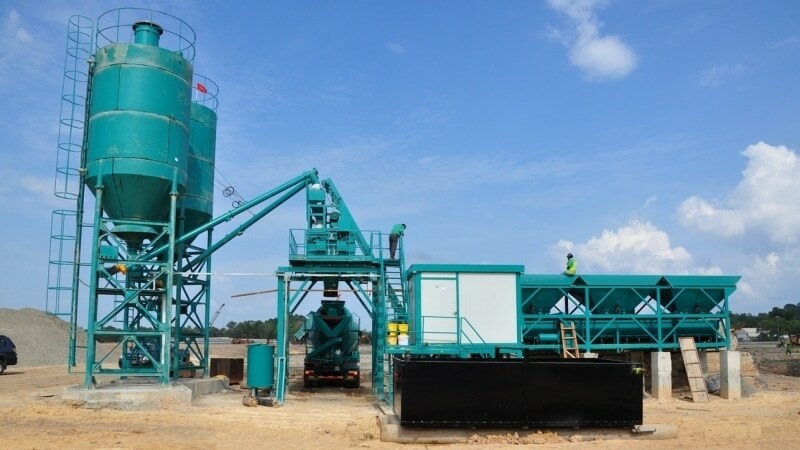 NICOL concrete batching plants are designed to suit various site requirements. We have delivered small plants of 25 cu.m per hour to huge installations of 2×300 cu.m per hour plant. 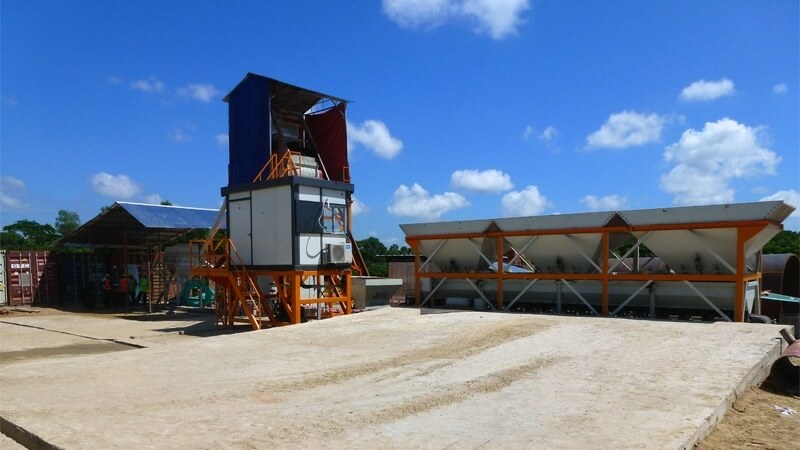 Our plants can accommodate bulk cement in developed areas and also bag cement in remote locations. We have set up plants in the most remote places where basic amenities are lacking and voltage fluctuations are substantial, we are equally adept at fully computerized plants with CCTV where big volumes of concrete are to be delivered within the shortest possible time. 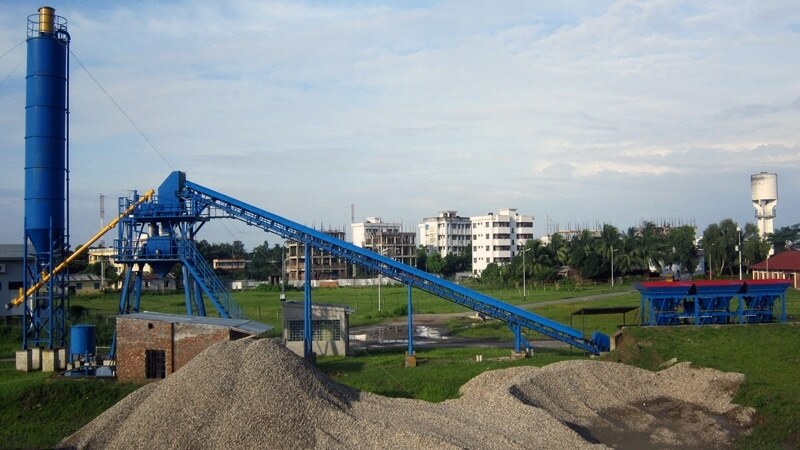 The twin shaft mixer is an integral part of the concrete plant where the raw materials are mixed thoroughly. The mixing arm, paddle and liner plates are made of high wear-resistant alloy steel containing a high percentage of chromium, manganese and molybdenum resulting in longer life span above industry average. 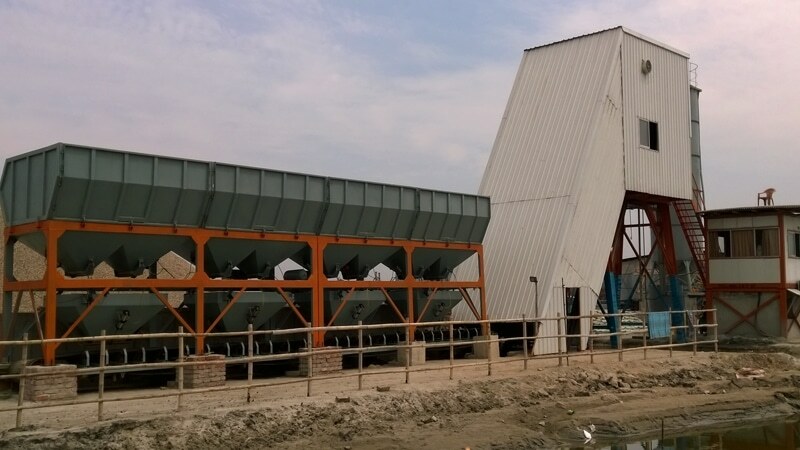 Aggregates and sand are stored in these hoppers before being discharged into the weighing hopper below. 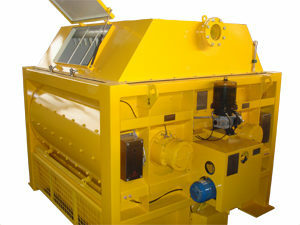 The weighing hopper can be single cumulative or individual. 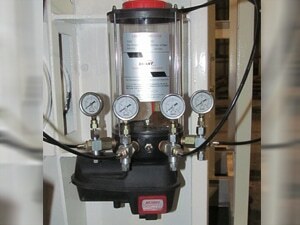 The raw materials are proportioned according to the mix design by electronic loadcell weighing. To ensure smooth discharging, vibrators are installed on some of the bins. 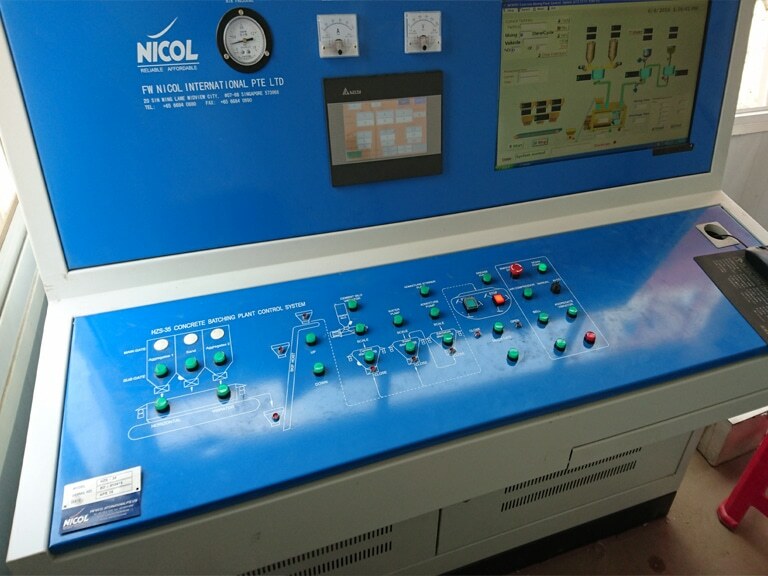 This user-friendly control panel is composed of a proven batching software and PLC for a fully automated operation. The computer screen is incorporated into the control panel allowing more work space. 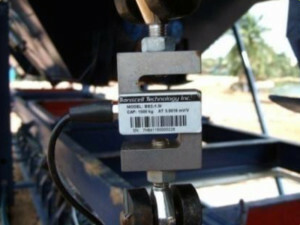 The loadcell indicators are replaced by a single touch screen monitor which is more reliable resulting in less downtime. 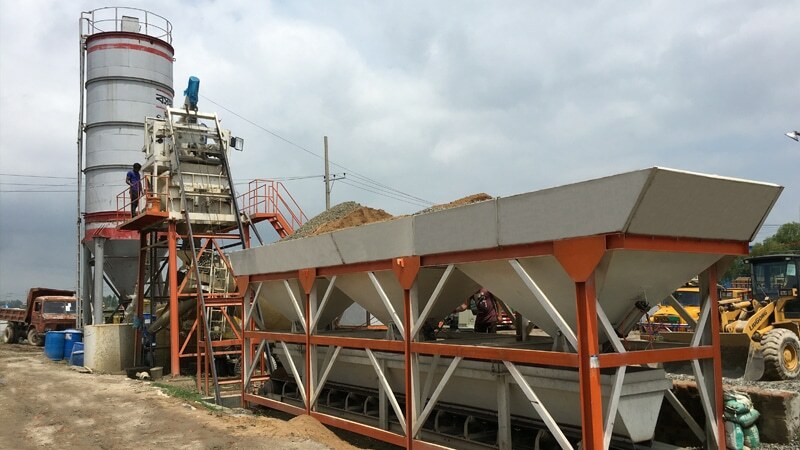 Depending on the applications on site, different grades of concrete are being produced. 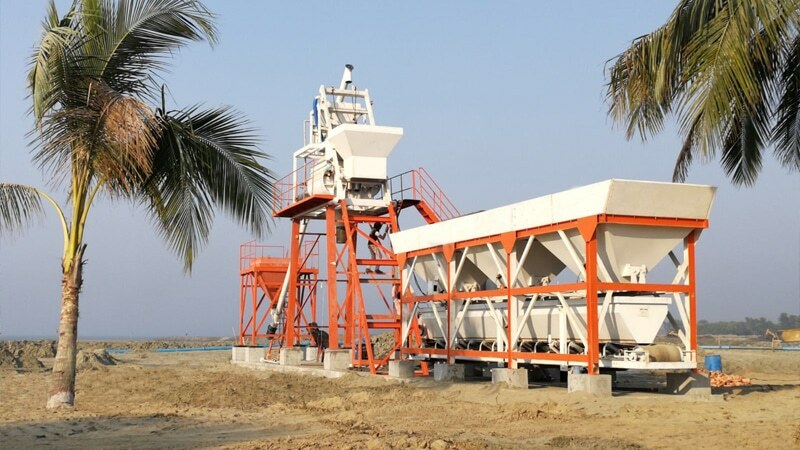 Thus, the raw materials are weighed and proportioned according to the mix design before adding to the mixer. Shear beam type and S-type loadcells are used in the plant to accurately weigh the aggregates, cement, water and admixture. 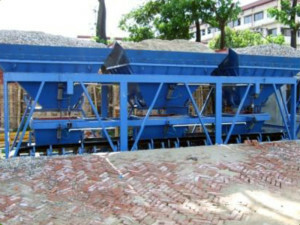 The twin shaft mixer is a major component of the concrete batching plant. Controlled amounts of grease are automatically delivered to the four bearings of the two shafts of the mixer while the plant is operating. This reliable system ensures a longer life span and minimum downtime.